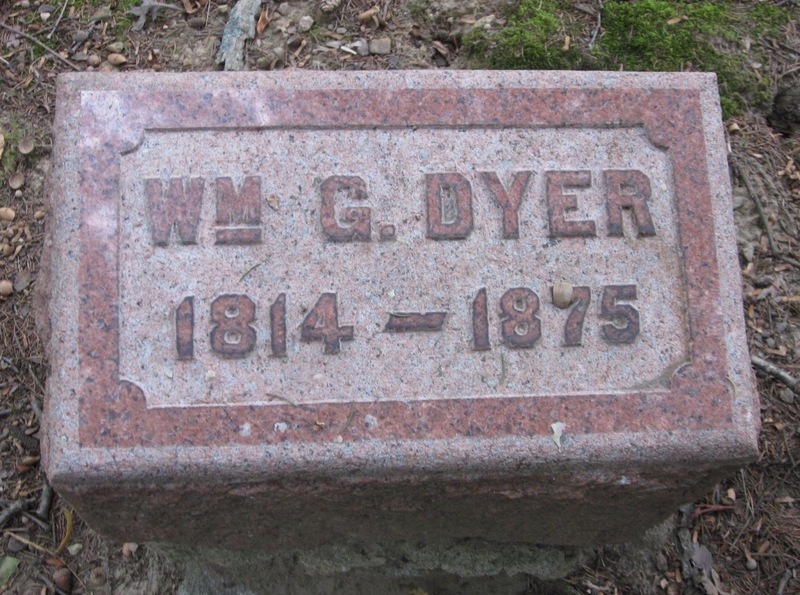 My third great grandfather, William G. Dyer is buried in Oakwood Cemetery, Adrian, Michigan. William was born on 8 February 1814 in New York City, New York, to yet to be identified parents. He married Mary Ann Swallow about 1837. They were the parents of five children: Adaline, George, Sarah, Mary and William B. William G. died 8 May 1875 in Adrian, Lenawee, Michigan. I would love to connect with Dyer family members. Please leave a comment if you are related to this family. 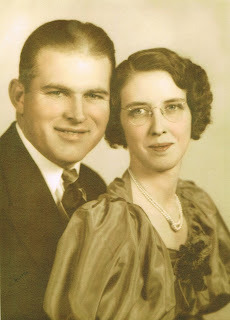 My mother's brother, Harold Clifton Fredricks, was born 26 July 1913, in Manistee County, Michigan-100 years ago today. He was the son of Daisy Ellen Graf. He lived to be 71 years old, dying in San Diego, California. Uncle Harold was a very nice and kind uncle. Although, I didn't see him much, I do remember the times he visited us in Harbor Beach or came to the family reunion. He shared stories of growing up. I wished I had asked a few more questions. 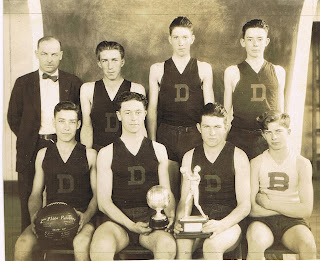 In honor of what would have been his 100th birthday, a photo tribute is below. Brethren High School Basketball Team-Harold is in the front row, third from left. 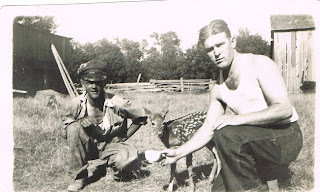 Harold on his Grandpa's, Valentine Graf, farm with a baby deer and unknown farm worker. L-R: Margaret Forror Fredricks, Harold Fredricks, Ray Fredricks, Marie Fredricks Kurth with Nancy Fredricks in front. Ray and Marie were Harold's brother and sister. Nancy is Harold and Margaret's daughter. Photo taken in California. My second great grandparents, Samuel Stillman Glover, Jr. and Adaline L. Glover, nee Dyer became the parents of twins on 24 July 1873, 140 years ago today. 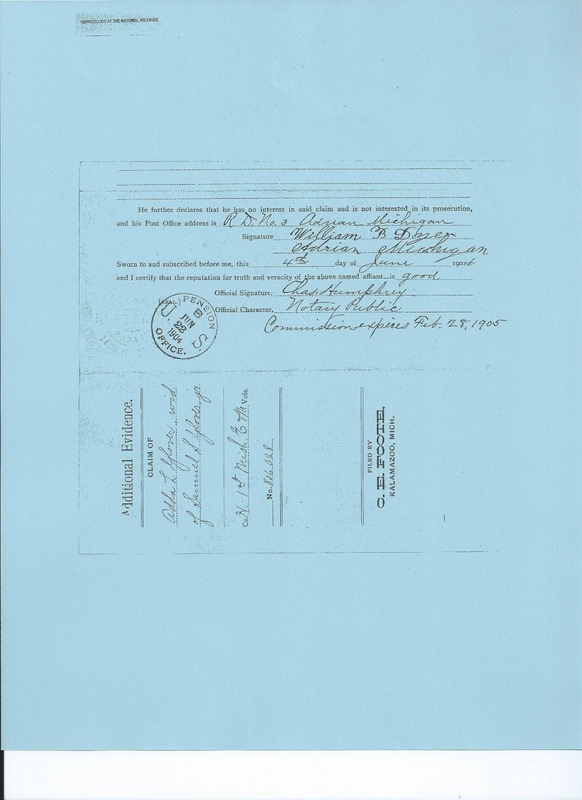 Source: The Church of Jesus Christ of Latter-day Saints [LDS], "FamilySearch," database, Michigan Births 1867-1902 (https://familysearch.org/pal:/MM9.3.1/TH-267-11882-40941-68?cc=1459684&wc=10520008 : accessed 10 July 2013), Manistee County Birth for Emma Glover and ____ Glover; date 24 July 1873; record number 1307. Emma Dora and Emerson Glover were born in Manistee, Michigan. It was news of the day in the Manistee newspapers. 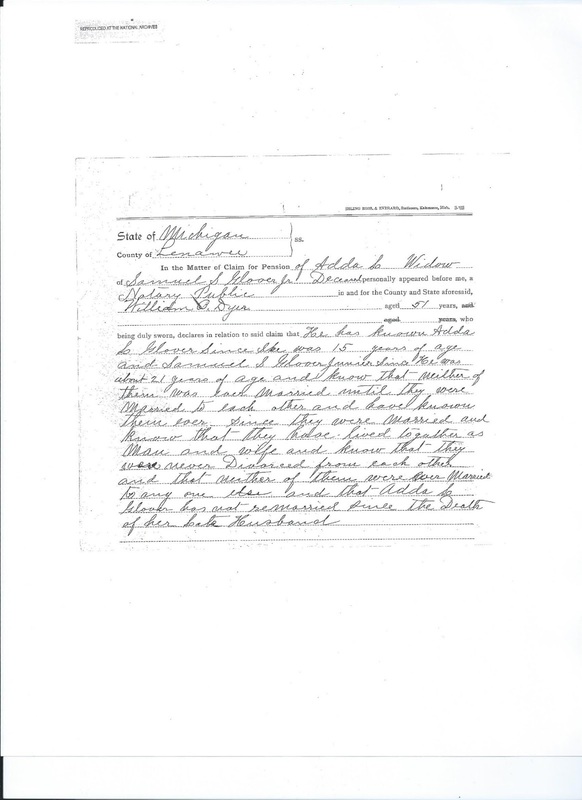 The Manistee Standard for 26 July 1873 reported, "Mrs. S. S. Glover has recently presented the "Squire" with a pair of twins." The meaning of the word "squire" for this article is a judge or other local dignitary. Samuel S. Glover was the Manistee City Justice or Justice of the Peace at the time of the twins birth. The record above states Adaline's maiden name, Dyer, which is accurate. I found it odd that no first name was recorded for the male twin, who was named Emerson. Emma and Emerson were the eighth and ninth children of ten, who were born to Samuel and Adaline. Unfortunately, Emma and Emerson both died at a young age. Emerson died three months later in October, 1874 of inflammation of bowels and Emma died at the age of six and a half months in February, 1874 of cholera. Two months ago, I bought Thomas W. Jones book, Mastering Genealogical Proof and decided to do an independent study of it. I wanted to join one of the groups that was studying it, but I couldn't commit to attending every session due to other commitments. I completed the first six of eight chapters the first two weeks I had the book. I committed myself to studying it. I didn't blog or research. Then, life got in the way. Summer came and the gardens beckoned, house projects needed to be done, and then family vacation time came. I miss not studying it. I am enjoying the study of this book. I even graded my assignments. My lowest score was 88% and my highest was 96%. (It is the teacher in me). What I like best about the book is the challenge it has presented me. There were a couple of times I had to lay the book aside and come back to it later because I needed a break. 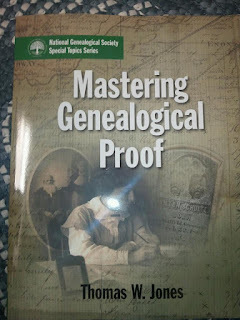 It is an intense study of the Genealogical Proof Standard. The concepts taught in Dr. Jones' book will enable me to become a better genealogist. I look at my research with a new eye now. I find I analyze records and sources more deeply. I cite my sources better. I enjoyed Chapter 4, the one on sources citations. Even though I use Roots Magic software and don't have to create my own sources unless I want to, it helped to write my own and learn the parts that are relevant to an accurate and complete citation. I plan to go back through my software and take a second look at my sources. I have two more chapters to go and then I plan to re-read the whole book. I would like to complete this by the end of July. If you haven't read this, I highly recommend it. It is one of the best genealogy resources I have found to date. 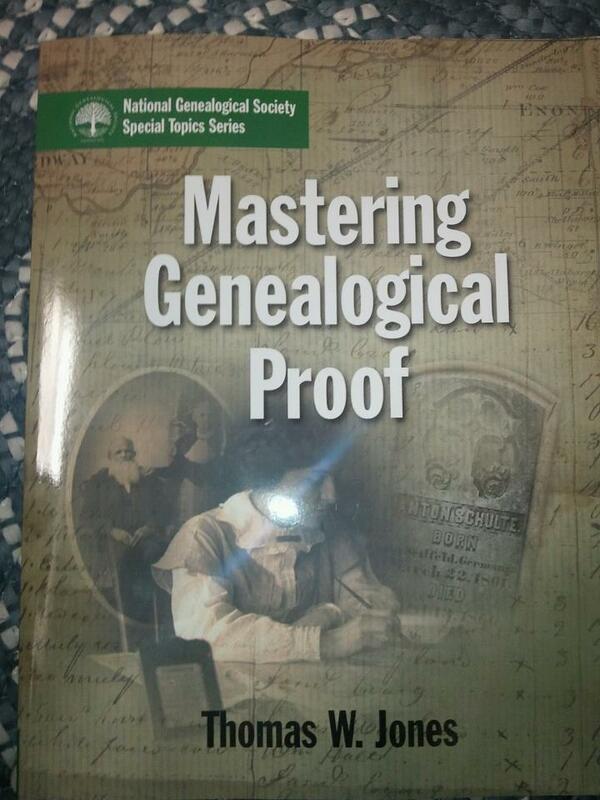 Have you read Mastering Genealogical Proof? What do you think? Are you as impressed as I am? I was so excited when I received notification that my picture request for my grandmother, Sarah L. Bell, had been fulfilled. I never thought I would see her gravestone as it is in Queen's Park Cemetery, Calgary, Canada. The first thing I said to my husband when I saw the picture was, "I will haunt you, if you ever bury me in the same cemetery plot with another wife!" So far, I am his only wife and he thought I was weird to even bring something like that up! But, he is getting use to my genealogical ways-I think. 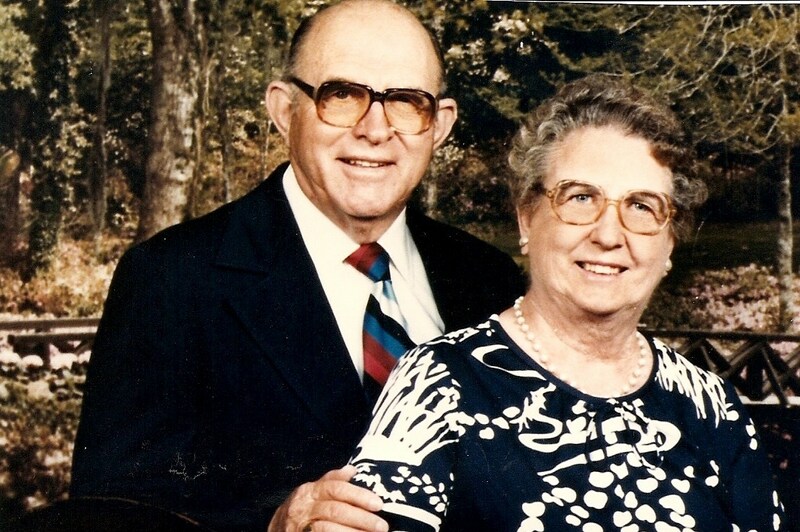 My grandmother married her second husband, Ray Bell, about four years after my grandfather's death. They moved to Calgary, Alberta, Canada. 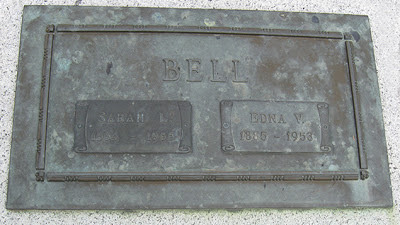 Grandma Bell died in Calgary on 31 March 1965. 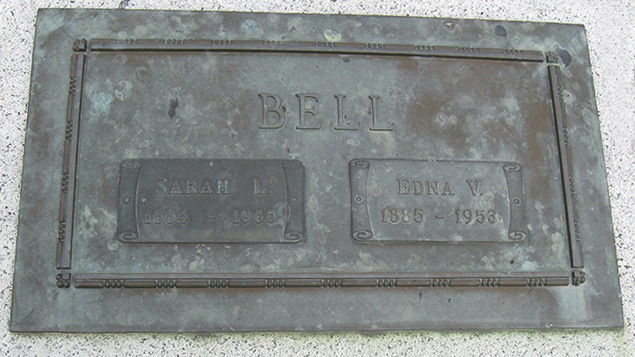 She is buried in the same plot and has her name on the same gravestone as Ray Bell's first wife, Edna. 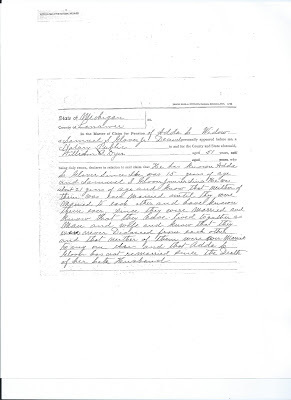 My grandmother had wished to be buried in Park Cemetery, Marquette, Michigan with her first husband, Harry Glover. A couple of years ago, my parents and I visited Park Cemetery and three plots had been purchased, only one was used-Harry Glover's. I imagine the paper work to transfer a body across country borders and the cost involved factored into the decision. But, still I am serious that I will haunt Kirk, if he does this to me. I guess I don't share well. I want my own headstone and plot. I want one with a QR code, too! One that has my genealogy on it. Today, is the Fredricks' Family Reunion at Brethren Park in Brethren, Michigan. I don't even know how many years the reunion has been held at the park. It has to be over 25 years now. We had a number of reunions at the family farm, in Brethren, before being moved to the park. One of the activities during the reunion is to have a white elephant sale. Each family is asked to bring a wrapped gift that is auctioned off. The proceeds help pay for the meat, paper products, postage, etc. for the next year. In addition, memory bricks are purchased for family members who are no longer with us. The memory bricks are laid at the Brethren Historical Museum. One year, I made a blog2print book of all the posts I had written about the Fredricks' family. I didn't wrap it as I wanted people to see it before they bid on it. It went for over $100. I was a little embarrassed it went for that much. This year, I have decided to do another genealogy related gift. I am framing pictures of my Fredricks grandparents, Otto and Daisy (Graf) Fredricks, and my great grandparents, J. August and Louise (Zastrow) Fredricks and Valentine and Nancy (Mast) Graf. I was planning on wrapping it, but my husband thinks I should set it out for all to see. I just don't want the bidding to go overboard. I have my dish to pass planned, camera packed, questions for Aunt Lola prepared, pictures to be identified, family group sheets prepared, and my white elephant gift ready. I am looking forward to this year's reunion. It should be fun.